Work smart with this ATV Disc Harrow, SAVE! No gymnastics necessary! Give your most far-flung food plot the V.I.P. treatment this coming season. Check it out, this ATV-sized Disc Harrow offers up adjustable wheel height and depth... a screwjack system lifts and lowers the wheels to exactly where you need them. No flipping or twisting or other awkward transformations to switch from transport to cutting, just a simple crank! Hook up and roll out, here you SAVE! Built to last you the long haul! 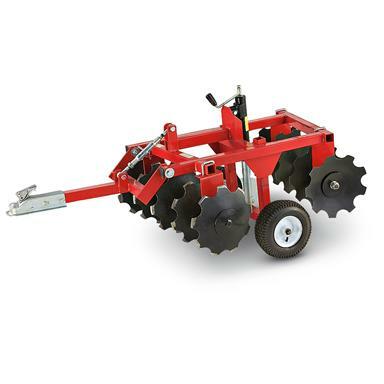 Constructed of 2" x 2" heavyweight steel, this Harrow is built for durability and reliability. Each of the ten 14" diamond notched disc blades can be removed and replaced as needed, saving you time and money. The first time you pull it behind your ATV, you'll feel the heft of this bad boy. This item is shipped by commercial carrier curbside. Unloading is the customer's responsibility, including off the back of the truck. This product Ships in 1 Box, Measures 42"l. x 18"w. x 30"h., and Weighs approx. 287 lbs. No expedited delivery. High-value orders require a physical street address, otherwise insurance costs will be added to the shipping total. 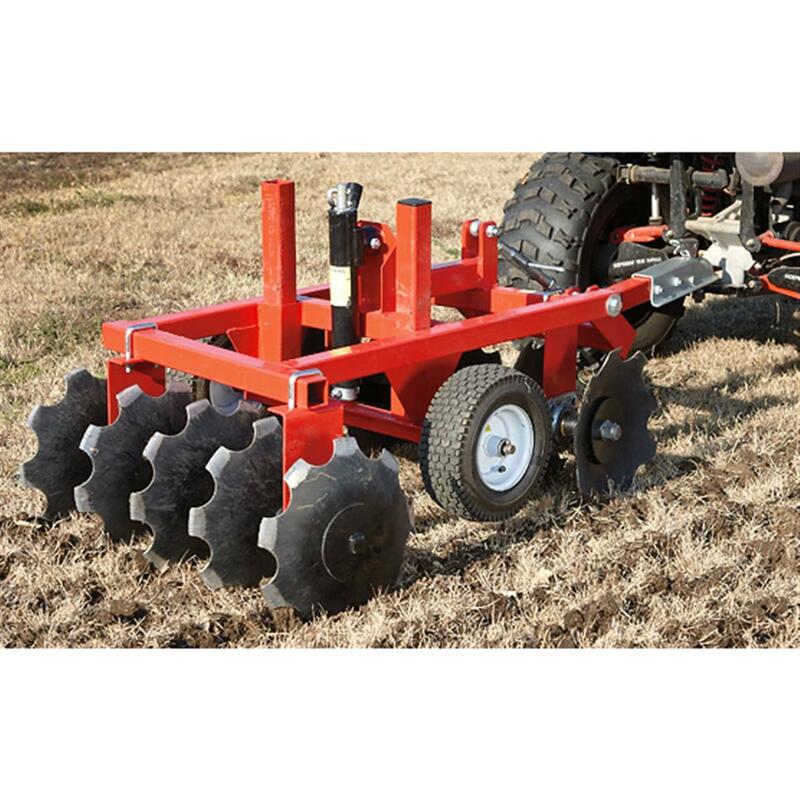 Field Tuff ATV Disc Harrow is rated 3.6 out of 5 by 7. Rated 5 out of 5 by Bob The Metal Guy from Just what I wanted This is a pretty awesome little harrow. Came packaged nicely, Easy to assemble, will need to add some weight to it. Exactly what I was looking for. Also glad it came in black and not red. Rated 3 out of 5 by foodploter from it'll work with 100lbsof weight it barely broke ground with very short grass, after making 15-20 passes from all directions it would start to break the ground. Also used it in my garden, it had the ground already broke from last year, the disc only dug up 2.5 inches of the top soil with 100lbs on it. Going to add more weight and see where it gets me. Rated 5 out of 5 by goowah from Assembly required! It works like it should but nowhere did it say Assembly Required. It arrived in 196 pieces and the washers were not identified in the instructions by size and it took some trial and error to get it right but we made food plots for the deer. Rated 1 out of 5 by arturo from Dissappointed! This did not have enough downward pressure even with two cinder blocks and concrete pavers attached to the wheel slides with straps. It took1hour and many passes and i could only break to 2.5 inches.